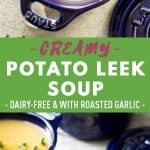 The most flavorful Creamy Potato Leek Soup ever! 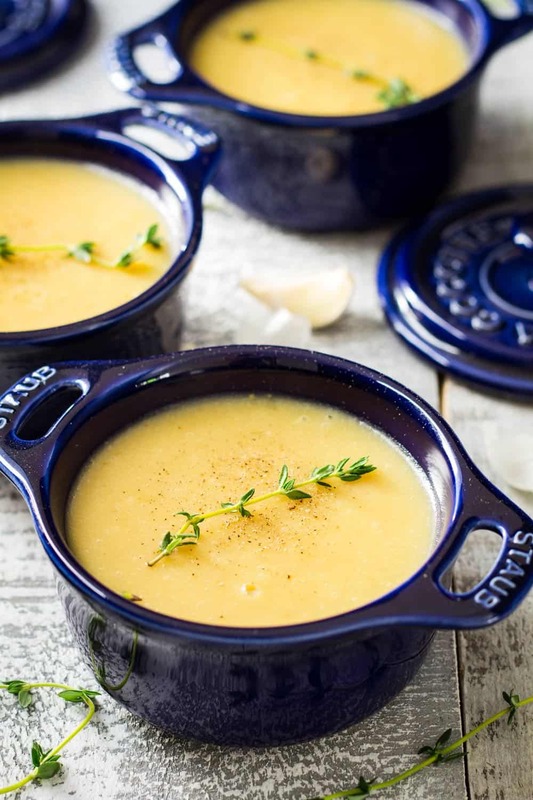 A bowl of hearty dairy-free potato soup with a nutty flavor thanks to a lot of roasted garlic. 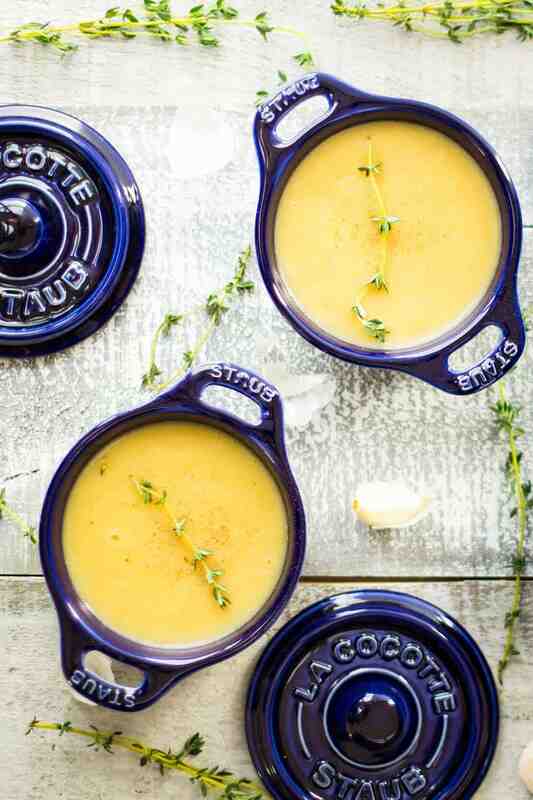 The number 1 recipe on the blog for 2015 was this Roasted Garlic Butternut Squash Soup. Since you all loved it so much, I went into soup experimentation mode again and came up with this Roasted Garlic Potato Leek Soup. I can’t decide if this is just as delicious as the butternut version or even better!! As in the butternut version, the roasted garlic is really the king again. This soup tastes completely different though. It is creamy and heart-warming and wintery delicious! 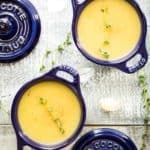 Can Potato Leek Soup be frozen? Absolutely! It’s great for freezing and to reheat you just need to place the frozen block of soup in a pot, add a splash of water and turn the heat to low, place the lid on, and let it defrost/reheat. Raw potatoes don’t freeze well at all. They become brown and kind of yucky. Cooked potatoes, however, such as in a potato soup, are fantastic for freezing. Potatoes alone are responsible for the creaminess of the soup. No heavy cream required at all. The roasted garlic and leek give it an extra special flavor and the hot broth gives the finishing touch for absolute perfection. The most important for a creamy potato leek soup without cream is to use starchy potatoes. The ones you’d use for mashed potatoes, too. The higher in starch the potatoes are, the creamier the soup. The lower in starch, the rubbier, gummier it will become. I do not recommend salad potatoes or baby potatoes for this soup. It’s pretty simple, all you have to do is replace the beef broth by vegetable stock. It will still be absolutely delicious and equally creamy. Pre-heat oven to 400 F (200°C). Peel off the paper-like outer layer of the garlic bulb, leaving intact the skins of the individual cloves and being careful to keep the bulb as a whole. Cut the top part of the garlic in order to expose the upper part of every clove. Drizzle a few drops of olive oil onto each clove. Place garlic bulb in cocotte and cover (or lack thereof wrap in aluminum foil). Put garlic in the preheated oven for about 40 minutes or until soft and golden. In the meantime, heat a big pot over medium heat. Once pot is hot, add a splash of avocado oil and add sliced leek. Reduce heat to medium-low. Caramelize leek on medium-low heat by stirring often. While leek is caramelizing and in-between stirring peel and dice potatoes into about 1" (2.5cm) cubes. Once leek is caramelized (about 20 minutes), add broth and peeled diced potatoes. Turn up the heat and bring to a boil, then reduce heat to medium-low again and cover. Once garlic is out of the oven and soft and tender and cold enough to handle, remove cloves from peel and add to bubbling soup. Cook soup until potatoes are soft. Transfer into blender in 2-3 batches, or use an immersion blender to blend and season with salt if necessary. Serve hot with a sprig of fresh thyme on top and freshly ground black pepper on top. This looks delicious! Can it be done in the Instant Pot? Lorena, I like the way you described this soup as “kissing your belly from the inside out.” If your son is anything like you, I’m sure he’s great with words! What a great story about how much he has overcome. Very inspiring! Also, those cocottes are ridiculously cute. THank you so much for your thoughtful comment Lindsey :D Makes me so happy to know people don’t only come for the recipe but to read a little as well *joy* I LOVE those cocottes. I wish I had the money to buy them in ALL colors!!! This soup sounds so delicious! There really is nothing better than the smell of roasted garlic wafting through the house. I could whip this up in a snap for dinner. What an awesome story about your son, I know you must be so proud! I wish I could have learned FOUR languages by the time I started school. 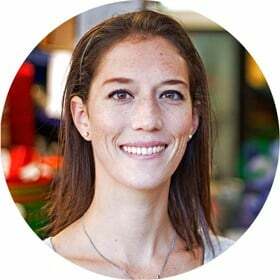 Us adults don’t learn languages so quickly!